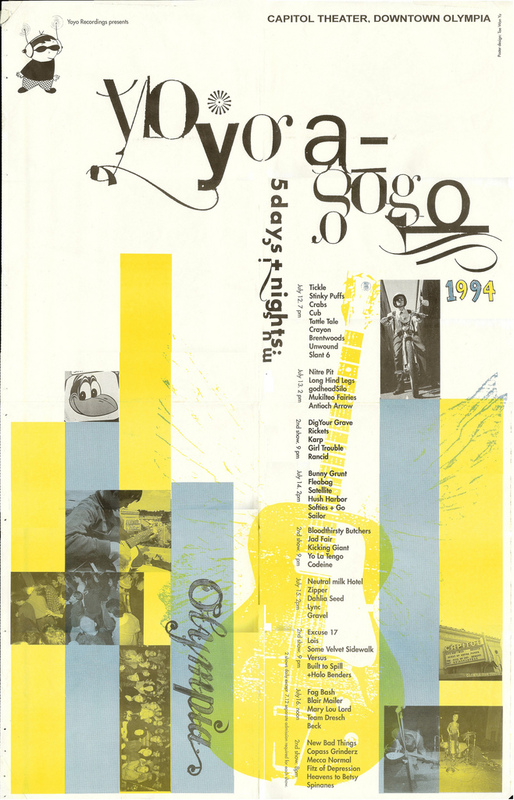 Yo Yo A Go Go was a 5 day festival in downtown Olympia, grouped into 2 shows a day (with each show having 5-6 acts). See the poster below, there are some great bands in there. Beck was a part of the afternoon show on the last day, July 16, and included Fag Bash, Blair Mailer, Mary Lou Lord and Team Dresch. Although surely other songs were performed, "Title Unknown, Sleeping Bag" was definitely played and eventually ended up on a Yo Yo A Go Go comp CD. From Indie List Digest, August 8 1994, Volume 3, Number 46: "Finally Beck played, first some generic punk stuff with what was apparently an ad-hoc band, then some more revealing folk-blues stuff. Very listenable, & not at all MTV minded, which was a mercy. Guests included the godheadSilo guy, who made "human beatbox" sounds during one song, and Calvin Johnson, who sang, thrashed around in what seemed to me an extremely self-conscious way, and then stomped offstage unceremoniously." In April 2018, someone uploaded to youtube the song with the godheadSilo singer - turns out it was 'Asskizz Powergrudge'!